Two of the best known Chinese encyclopaedias date from the the reign of the second Song emperor, and bear the name of the Taiping period (976-983) in which they were compiled: the Taiping guangji 太平廣記 in 500 chapters, and the Taiping yulan 太平御覽 in 1,000 chapters. Both were compiled at imperial behest by the scholar Li Fang 李昉 working with a team of editorial assistants. The Taiping yulan is the subject of this blog entry, in which I will describe two editions of it to be found in the Backhouse Collection, after a few words about each of the two encycopaedias by way of explanation. The Taiping guangji 太平廣記 (guangji meaning “extensive record”), completed in 981, was compiled from informal, unofficial sources, such as histories written by private scholars and even accounts which we would regard as fairy tales. The compilation is derived from 475 different texts, of which one half are now lost, so that the Taiping guangji is now the most important source for early Chinese fiction. The Taiping yulan 太平御覽 on the other hand was a more general encyclopaedia, and was compiled from what at the time were regarded as more acceptable sources. As a repository for lost texts, it is even more impressive, for of the two thousand or so books and pamphlets from which it was compiled (of which 1,690 are listed in a prefatory chapter), three-quarters are no longer extant. The Taiping yulan is not only bigger than any previous encyclopaedia, but at the time it was written also the biggest single Chinese work ever to have been compiled and published. It was completed in 983 and was first entitled Taiping leibian 太平类编 (leibian meaning “arranged in categories”), but it was then passed to the emperor, who examined three chapters a day during the course of almost an entire year, after which the second part of the name was changed to yulan, meaning “imperially perused”. This reminds us of the prototype Chinese encyclopaedia, the Huanglan 皇覽 (“for perusal by the emperor”), which was compiled for emperor Wen 文 of the Wei 魏 dynasty, who reigned from AD 220-227. This work is no longer extant, but some fragments quoted in other texts were pieced together by Sun Fengyi 孫馮翼 at the end of the 18th century. It was a collection of excerpts from the national literature, presented to the emperor in a way that was convenient for him to read, and is believed to have contained 120 chapters. I have spent more time on this work than on any other in the Bodleian’s collections, because it has been necessary to examine every single leaf carefully – and there are over 12,000. I did this in the early 1980s when I was preparing my catalogue of the Backhouse Collection for publication. Then thirty years later, when I began to prepare this blog entry, I got out my old notes and started to transcribe details from them. Half way through, I stopped to do other things. The next day, the notes had disappeared. I searched high and low for them, and can only suppose that I accidentally put them in the recycling box, and that they have now been reincarnated as lavatory paper. So last week I had to examine every single leaf all over again. Normally, one wouldn’t examine a large work in this way. But in this case, there were no evidences of any kind as to the imprint, whether of the block printed or moveable type editions – no prefaces or postfaces, no colophon, and no indications on the blocks; and also, I caught sight of one of the very distinctive leaves from the moveable type edition, which was rather exciting. It turned out to be from the well-known but extremely rare edition printed by Zhou Tang 周堂 in 1574 from engraved bronze moveable type. I derive my information about this edition from K.T. Wu’s 吳光清 classic article Ming printing and printers (Harvard journal of Asiatic studies 7:3, 1943, 203-260), where it is described on p.220; and also Wang Zhongmin’s 王重民 description of two copies of the work on pp.355-357 of his equally classic Zhongguo shanben tiyao 中國善本書提要 (this work, by the way, was completed by others and published posthumously for the first time in Shanghai in 1983). According to K.T. 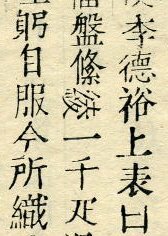 Wu, Rao Shiren 饒世仁 and You Tinggui 游廷桂 were both professional printers in Fujian, who made the engraved bronze (仝 = 銅) types at Wusi. These were subsequently acquired by collectors there who used them to have the book published under the supervision of Zhou Tang 周堂, who wrote a preface dated 1574. 卷16-25; 81:1,8; 83:1,2; 340:10; 361:1-5,7-11; 362-365; 366:1-4,8-13; 367:1,2,4-12; 368:2-10; 369; 370:1-5,7-10; 378:12 (this leaf has 「卷三百七十八」 in the banxin 版心 but 「卷第三百十八」 at the chapter ending 卷末); 387:1; 464:2; 573:7; 632:6; 691:1; 755:6; 812:8; 814:4; 816:2,5,6; 821:2,4; 824:7; 828:13; 981:1,3,4; 983:1,2. This occurs on leaf 816:6 (which happens to be mis-bound between pp.7 and 8). Sometimes, moveable-type editions are less easy to identify, and the characteristics listed above may be largely absent – a good example being our second Backhouse copy of Taiping yulan described below, which has been printed to a very high technical standard. In a blockprinted edition, the lowest extremity of one character can, and frequently does, overlap with the highest extremity of the next; in a moveable-type edition, this is obviously impossible. The main part of the Bodleian copy must be from Ni Bing’s 倪炳 block-printed edition of 1573, which is alike in format, and also rare. 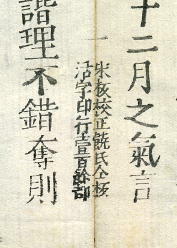 Outside the text of Taiping yulan, I have only been able to find the words 「江孔脩校錄」 which appear at the very end of juan 34. Ni Bing’s edition has been produced rather carelessly. For example, the banxin 版心 of juan 185:3 has 「卷一百八十四」, 325:9 has 「卷四百二十五」, and 451:6 and 7 both have 「卷四百五十二」; the chapter ending 卷末 of juan 281 has 「卷第二百八十二」; juan 964:1 has 「卷六十四」 at its beginning 卷端, and 「九百六十七卷」 in the banxin. 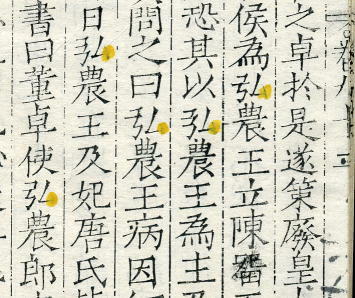 In juan 742, the juan numbering is treated as page numbering, so that 742:7 has 「七百四十三卷」 in the banxin, and 742:8 has 「七百四十四卷」; order is restored at 742:9. Some mistakes are of the sort one might expect to find in a typeset edition. Juan 73:4 has 「卷三十七」 in the banxin; 405:6 has 「卷四卷百五」; 825 has 「卷第八百五十二」 at its beginning 卷端, and 925 has 「卷第九百二五十」. The careless approach evident in the block-cutting is also apparent in the collation of the printed leaves, so that for example there are two copies of 302:3, one in its correct place, and the other where 337:3 should be; and the collator of juan 351 must have been drunk, as 344:4 in inserted for 351:4, 310:6 for 351:6, and 342:8 for 351:8. Instances of missing leaves are legion. One single leaf in the entire copy is supplied in manuscript: 26:1. The characters have been altered by deleting the final stroke with a yellow brush, except in the case of the characters li 曆 and li 歷, where the first stoke of the element he 禾 has been struck out. I wonder if the excessively pious individual who conducted this laborious operation really knew what he was about? The rules state that the character li 曆 may be replaced with li 歷, which is not itself taboo. So the copy must have been put together by 1796 at the latest. The fascicles are contained in 20 tao (8 in each) which are covered in coloured silk brocade, fastened with red-stained bone pegs, and bearing manuscript labels. I suppose the tao are contemporary with the marriage of the two editions in the 18th century; some of them are in bad condition. There are no collectors’ seals. This has much more integrity than Backhouse 534, and is a classic example of a scholarly edition. 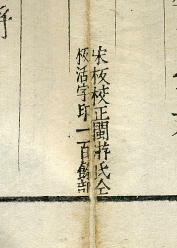 There is no “title” (or “cover”) page 封面: the book starts with a series of prefaces, starting with the preface relating to the edition 太平御覽叙, by Yi Bingshou 伊秉綬, and dated 1806 (嘉慶十一年). 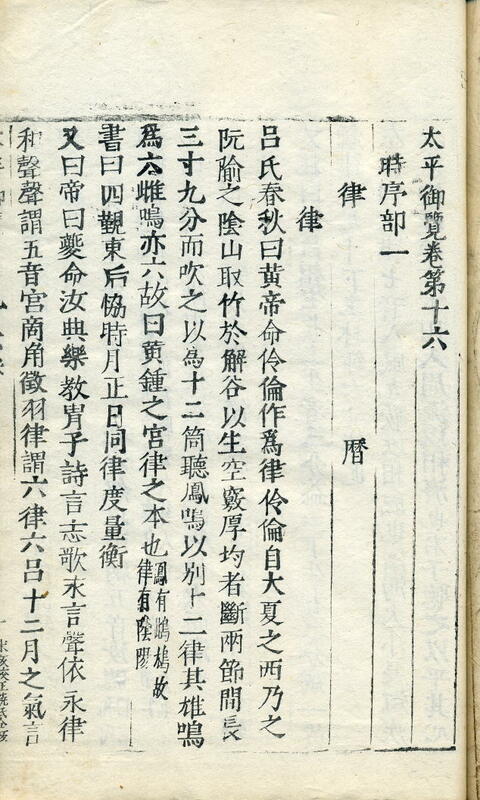 Yi Bingshou was prefect of Yangzhou 楊州, and tells us that Wang Changxu 汪昌序 owned a copy of the Ming moveable-type edition, and decided to reprint 120 copies of it, again in moveable-type. There follow the preface and postface (後序) to Zhou Tang’s edition (on which Wang’s was based), and then two Song postfaces (後序). 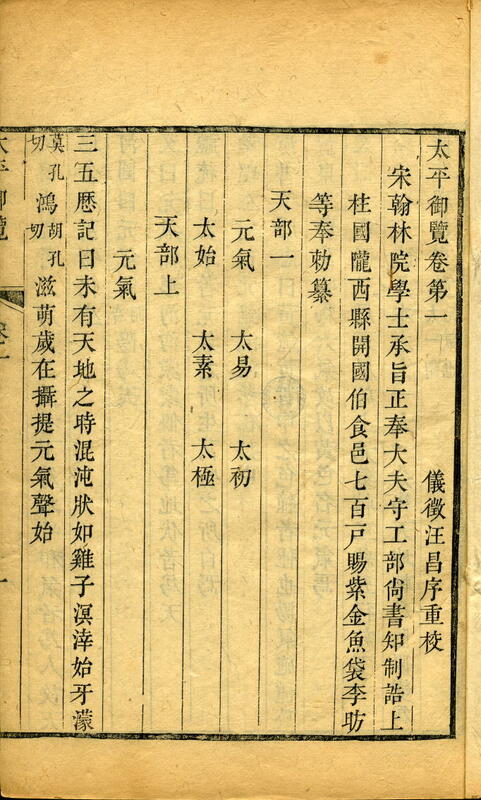 The table of contents is in 10 juan, like Ni Bing’s printed edition. This is strange, as in Zhou Tang’s edition, the table of contents is in 15 juan. There are also significant textual differences between the two moveable type editions. 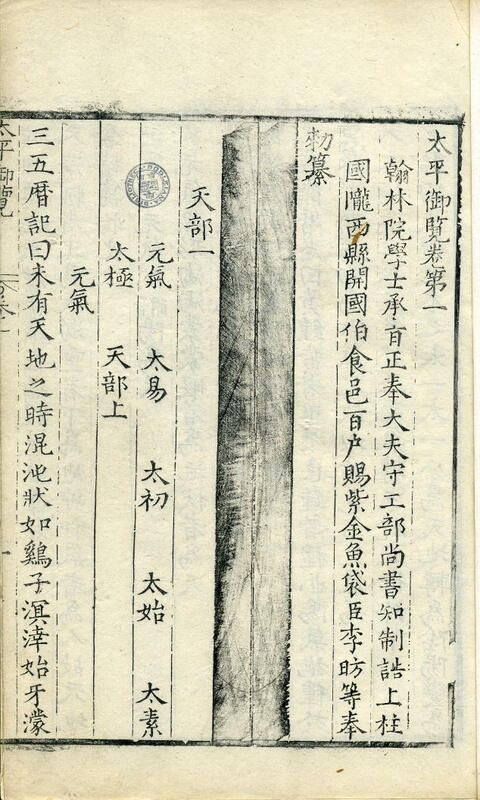 There is a single seal 「平水周氏書記」 showing that the book was once owned by a certain Mr. Zhou from Pingshui, now a town (镇) in Shaoxing county 绍兴县, Zhejiang province 浙江省.